HAVE YOU EVER CONSIDERED GETTING LIP FILLERS? Lip fillers and non surgical cosmetic procedures have become increasingly popular over the past few years, due to social media, and celebrities such as Kylie Jenner, Kim Kardashian and Megan Fox, just to name a few. 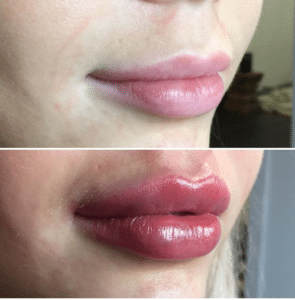 Filler can be used in the lips to not only add volume but to correct asymmetry, correct proportions of the lips, add definition to the lip border as well as changing the shape of the lips. We’ve put together a beginners guide on everything you need to know about lip fillers (also commonly known as lip enhancement, lip augmentation, lip injections). So, What are lip fillers? Lip filler (lip augmentation, lip enhancement , lip injections) is a non surgical cosmetic procedure that aims to enhance the appearance of the lips by increasing their fullness, adding volume & definition, as well as hydrating, softening & decreasing wrinkles around the mouth. This procedure is done using cosmetic fillers. Fillers are made out of natural-occurring sugar substances that are found in the body. Who is a candidate for lip filler? Basically anyone over the age of 18 who is fit and healthy. The longevity of the filler is dependant on what type of filler used and the area that the filler is being injected in to. Typically in the lips, filler logenvity can range from anywhere between 6 to 18 months. In general, the more treatments and fillers you get the longer the product starts to last. Filler naturally breaks down over time. Compared to many other areas, this process is accelerated in areas with high muscle movements such as the lips – simply because you use your lips everyday to talk, eat, drink et cetera. Metabolism also comes into play with how long filler lasts, in patients who are more active, it tends to be resorbed quicker than in those who are more sedentary. Lip filler can also be dissolved if you decide you do not like them. Are there any side effects with getting lip filler? Common side effects of lip filler are swelling and bruising. Swelling will start to subside by day 4 but may last up to 2-4 weeks post treatment. Bruising will typically last a couple of days but is usually easily covered with some makeup. Occasionally, there might be some small lumps and bumps in the lips which usually smooth out on their own or can be massaged out. What to do/avoid before and after? We recommend to avoid supplements and medications * that thin the blood 1 week prior. Common things to avoid include aspirin, ibuprofen (Nurofen etc) and other non-inflammatory pain killers, fish oil, Vitamin E and alcohol. * Please consult your regular doctor if you need to stop any prescribed medications. After your treatment, we typically advise avoiding makeup on or around the lips for 4 hours and heavy exercise. How many mLs will you need? This again varies individually with factors such as lip size & treatment goal as major influencing factors. If you are wanting a subtle enhancement/hydration, you may be happy with 1mL in the lips, however if you’re lips are quite small and you’re wanting Kylie Jenner lips than you’ll be looking at around 3-4 mls over a course of a few months. All lip treatments can be done 4 weekly apart until we reach your desired outcomes. National cost for lip fillers can cost anywhere between $400-$800 per ml. If your paying any less than $400 per ml it should make you a little cautious. Cheap filler is not good filler, and good filler is never cheap. 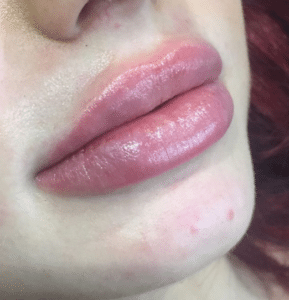 At the Eleventh Heaven, lip injections typically cost $450 and above. Does getting lip filler hurt? Here at Eleventh Heaven, we use medical grade topical anaesthetic to numb the lips prior to injecting. The fillers we used also contain local anaesthetics which will numb the area even more as we inject. Overall, the procedure it quite painless and bearable. What does having filler in the lips feel like? When the lips are first injected they can feel slightly tight and firm. As the swelling starts to subside and the products start to integrate with your lip tissues, they will feel natural and usual again. The most important step to lip enhancement is finding the right doctor. Find a Doctor, Dermatologist or Plastic Surgeon that specialises in Aesthetic Medicine. Do you research, read reviews, check out before and after photos, and book in a consultation and flood them with your questions. At Eleventh Heaven, Dr Ricky Sia conducts an in depth 30 minutes consultation for all patients before all procedures. During this consultation, a full aesthetic facial assessment, understanding and evaluation of personal goals and suitability for the treatment will be discussed thoroughly. Any questions or concerns are welcome and encouraged during this time, to ensure you’re well informed and optimistic about your treatment. Whether you are wanting a subtle hydrated look or a more plumper, fuller pout, Dr Ricky can design them all. If you’re interested in having your lips injected by Dr Ricky Sia, please contact us (07) 3108 9618 to book in a consultation. DOUBLE CHIN NO MORE! AND best of all, no surgery or scalpel involved. The revolutionary “surgery in a syringe” treatment by Allergan is now finally in Brisbane and Eleventh Heaven is one of the first few selected clinics in Queensland to be credentialed to offer this treatment. The double chin dissolver* is formulated in the United States and has been under development for over a decade. It has been used in the United States & other countries for a few years and has only just been released by TGA (Therapeutic Goods Australia) earlier this year. So what is this treatment exactly? This injectable treatment contains a naturally occurring acid that breaks down the fat cell walls at the injection sites. If you like, think about it as poking multiple holes on a balloon so that the balloon is basically destroyed anymore as it cannot inflate anymore. Same applies to the fat cells. Good news is that the amount of fat cells we can produce once we reach adulthood plateaus so once they are destroyed, it’s basically a long lasting outcome once full results are obtained. Ever wonder why someone is slim yet has a double chin? Ever wonder why someone exercises and eats wells, yet has a double chin? Unlike previous treatments like compounded version of fat dissolving injections (where formula & results are unpredictable and inferior), this treatment gives better & more predictable responses. It also replaces the need for liposuction or surgical removal for mild-moderate cases (of course, if it is a severe case, surgical option might still be the way to go). There is no downtime and discomfort associated with liposuction & surgical removal. Not really – as we use local anaesthetics & ice to ensure your maximum comfort. Swelling is to be expected due to the fat cell destruction process. A degree of dull-ache & numbness at the treated area is common. Typically, one will require 2-4 treatments depending on severity & surface area treated. Costs: $2580 for 2 sessions (2 vials each session). BEFORE/AFTER – One Session with One Vial. Actual patient of Eleventh Heaven. Please do not distribute image without written consent.